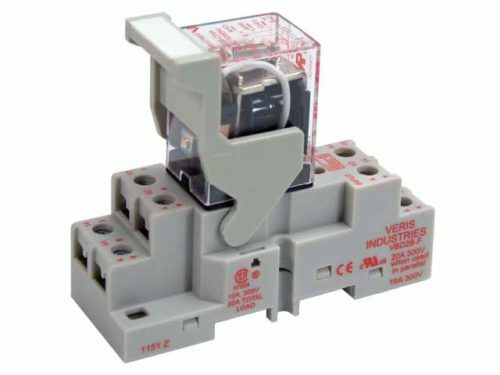 VMD1B-C120A Relay and VBD1B-C Socket, Current: maximum 15A, minimum 100mA @ 5VDC, Coil voltage: 120VAC. SPDT,finger safe terminals. CE,UL,RoHS. 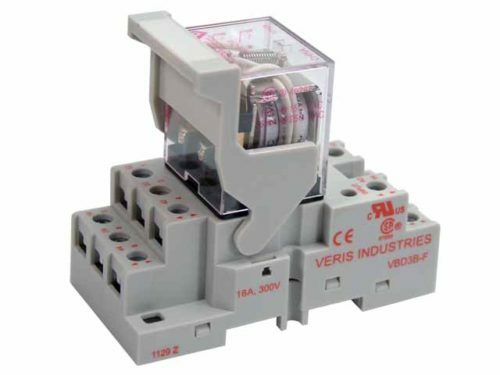 VMD1B-C12D Relay and VBD1B-C Socket, Current: maximum 15A, minimum 100mA @ 5VDC, Coil voltage: 12VDC. SPDT,finger safe terminals. CE,UL,RoHS. 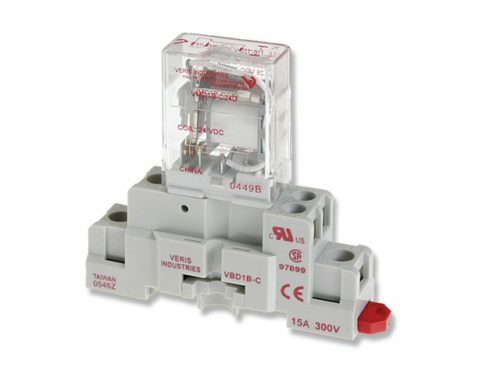 VMD1B-C24A Relay and VBD1B-C Socket, Current: maximum 15A, minimum 100mA @ 5VDC, Coil voltage: 24VAC. SPDT,finger safe terminals. CE,UL,RoHS. 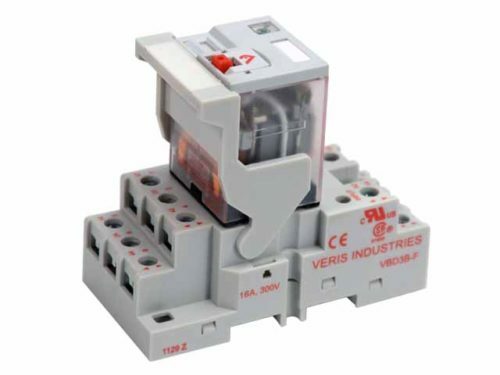 VMD1B-C24D Relay and VBD1B-C Socket, Current: maximum 15A, minimum 100mA @ 5VDC, Coil voltage: 24VDC. SPDT,finger safe terminals. CE,UL,RoHS. VMD1B-F120A Relay and VBD1B-C Socket, Current: maximum 15A, minimum 100mA @ 5VDC, Coil voltage: 120VAC. SPDT,finger safe terminals. CE,UL,RoHS. VMD1B-F12D Relay and VBD1B-C Socket, Current: maximum 15A, minimum 100mA @ 5VDC, Coil voltage: 12VDC, LED status, override lever, I.D. tag. SPDT,finger safe terminals. CE,UL,RoHS. 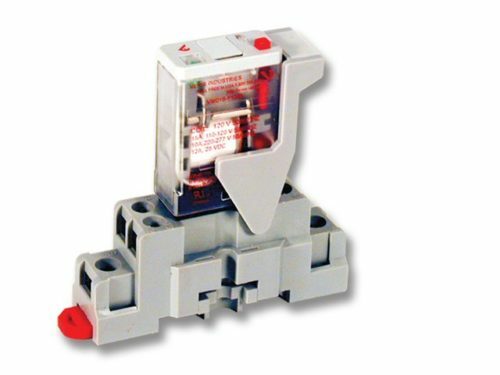 VMD1B-F240A Relay and VBD1B-C Socket, Current: maximum 15A, minimum 100mA @ 5VDC, Coil voltage: 240VAC, LED status, override lever, I.D. tag. SPDT,finger safe terminals. CE,UL,RoHS. 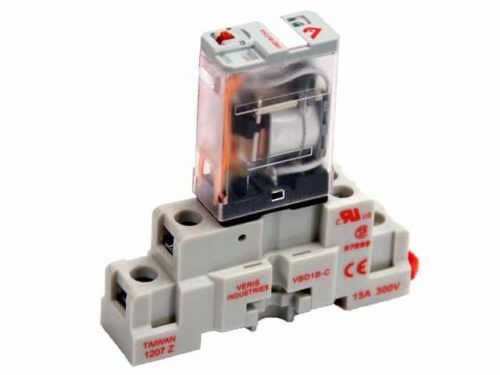 VMD1B-F24A Relay and VBD1B-C Socket, Current: maximum 15A, minimum 100mA @ 5VDC, Coil voltage: 24VAC, LED status, override lever, I.D. tag. SPDT,finger safe terminals. CE,UL,RoHS. VMD1B-F24D Relay and VBD1B-C Socket, Current: maximum 15A, minimum 100mA @ 5VDC, Coil voltage: 24VDC, LED status, override lever, I.D. tag. SPDT,finger safe terminals. CE,UL,RoHS. 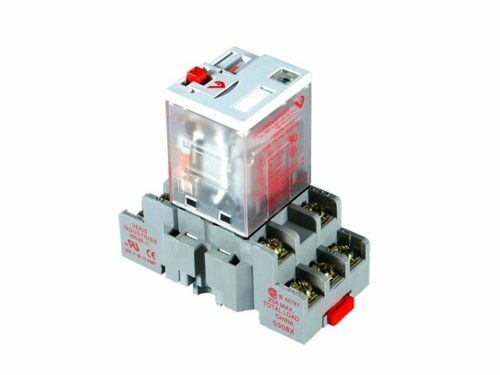 VMD2B-F240A Relay and VBD2B-C Socket, Current: maximum 10A, minimum 100mA @ 5VDC, Coil voltage: 240VAC, LED status, override lever, I.D. tag. DPDT. CE,UL,RoHS. VMD3B-F120A Relay and VBD3B-C Socket, Current: maximum 10A, minimum 100mA @ 5VDC, Coil voltage: 120VAC, LED status, override lever, I.D. tag. 3PDT. CE,UL,RoHS. VMD3B-F24A Relay and VBD3B-C Socket, Current: maximum 10A, minimum 100mA @ 5VDC, Coil voltage: 24VAC, LED status, override lever, I.D. tag. 3PDT. CE,UL,RoHS. VMD3B-F24D Relay and VBD3B-C Socket, Current: maximum 10A, minimum 100mA @ 5VDC, Coil voltage: 24VDC, LED status, override lever, I.D. tag. 3PDT. CE,UL,RoHS. 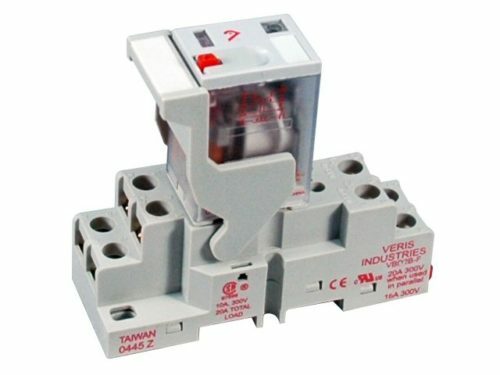 VMD4B-C120A Relay and VBD4B-C Socket, Current: maximum 10A, mimimum 100mA @ 5VDC, Coil voltage: 120VAC. 4PDT. CE,UL,RoHS. 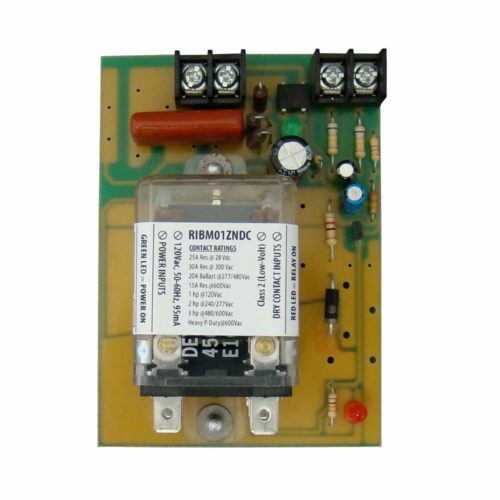 VMD4B-C24A Relay and VBD4B-C Socket, Current: maximum 10A, mimimum 100mA @ 5VDC, Coil voltage: 24VAC. 4PDT. CE,UL,RoHS. VMD4B-C24D Relay and VBD4B-C Socket, Current: maximum 10A, mimimum 100mA @ 5VDC, Coil voltage: 24VDC. 4PDT. CE,UL,RoHS. 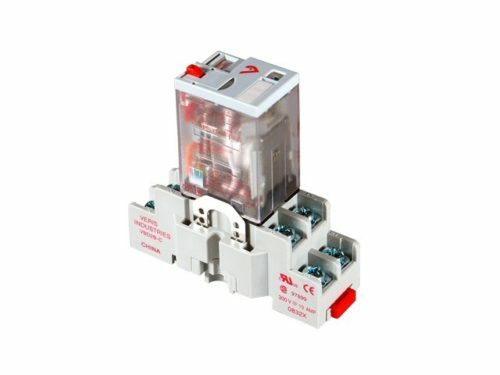 VMD4B-CL120A Relay and VBD4B-C Socket, Current: maximum 10A, mimimum 100mA @ 5VDC, Coil voltage: 120VAC, LED status, override lever, I.D. tag. 4PDT. CE,UL,RoHS. 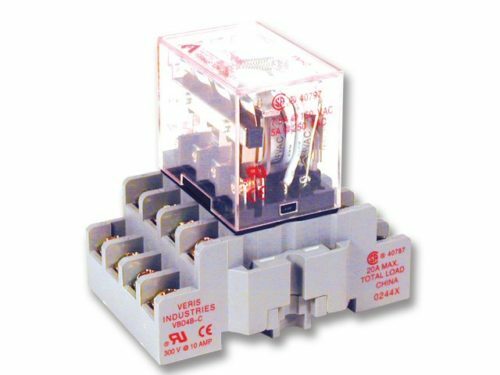 VMD4B-CL24D Relay and VBD4B-C Socket, Current: maximum 10A, mimimum 100mA @ 5VDC, Coil voltage: 24VDC, LED status, override lever, I.D. tag. 4PDT. CE,UL,RoHS. 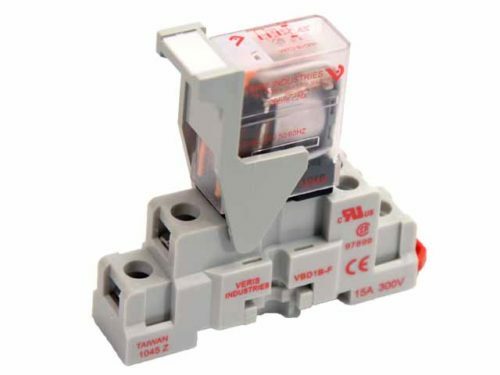 VMD1B-F240A Relay and VBD1B-F Socket, Current: maximum 15A, minimum 100mA @ 5VDC, Coil voltage: 240VAC, LED status, override lever, I.D. tag. SPDT,finger safe terminals, hold down clip. CE,UL,RoHS. 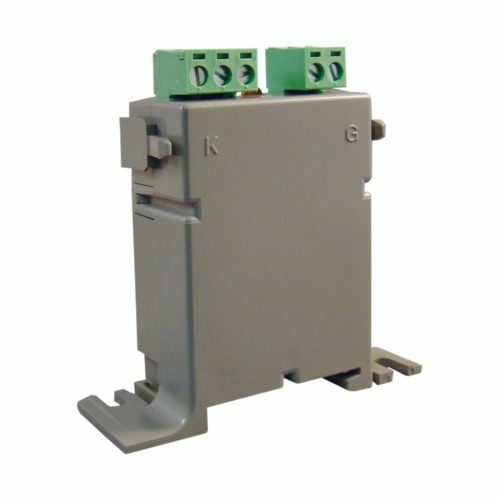 VMD2B-F240A Relay and VBD2B-F Socket, Current: maximum 10A, minimum 100mA @ 5VDC, Coil voltage: 240VAC, LED status, override lever, I.D. tag. DPDT,finger safe terminals, hold down clip. CE,UL,RoHS. 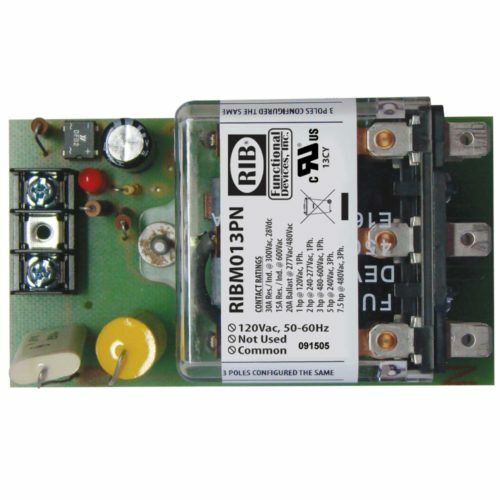 VMD3B-C24A Relay and VBD3B-F Socket, Current: maximum 10A, minimum 100mA @ 5VDC, Coil voltage: 24VAC. 3PDT,finger safe terminals, hold down clip. CE,UL,RoHS. VMD3B-C24D Relay and VBD3B-F Socket, Current: maximum 10A, minimum 100mA @ 5VDC, Coil voltage: 24VDC. 3PDT,finger safe terminals, hold down clip. CE,UL,RoHS. VMD3B-F120A Relay and VBD3B-F Socket, Current: maximum 10A, minimum 100mA @ 5VDC, Coil voltage: 120VAC, LED status, override lever, I.D. tag. 3PDT,finger safe terminals, hold down clip. CE,UL,RoHS. VMD3B-F24A Relay and VBD3B-F Socket, Current: maximum 10A, minimum 100mA @ 5VDC, Coil voltage: 24VAC, LED status, override lever, I.D. tag. 3PDT,finger safe terminals, hold down clip. CE,UL,RoHS. VMD3B-F24D Relay and VBD3B-F Socket, Current: maximum 10A, minimum 100mA @ 5VDC, Coil voltage: 24VDC, LED status, override lever, I.D. tag. 3PDT,finger safe terminals, hold down clip. CE,UL,RoHS. 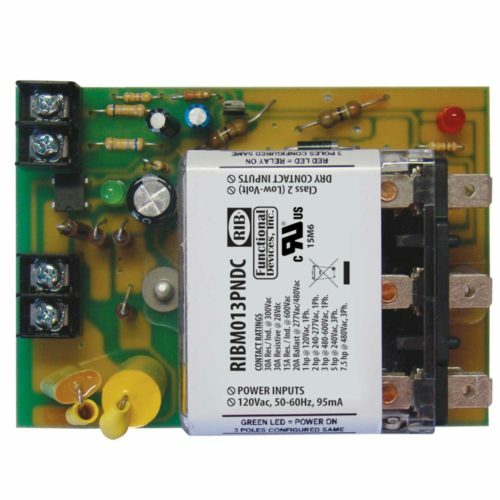 Track Mount Pilot Relay 10 Amp SPDT with 12 Vac/dc Coil. DIN rail mountable with current sensor, mount option. Track Mount Pilot Relay 10 Amp SPDT with 24 Vac/dc Coil. DIN rail mountable with current sensor mount option.